Vaillancourt sits up front at Wings over Wheels. I rose early that morning, right around dawn. Not because of the impending rays of the new morning sun, or the 58-degree air that had seeped through my open bedroom window, or those damned chirping birds, but because I was nervous. Nervous because I had a date. A date with the Yankee Lady. I was told to report to the airfield at 0900 to take my seat on this vintage World War II bomber, undoubtedly like thousands of members of America's Greatest Generation – you know, the one that endured a global depression only to be enveloped in global warfare? They flew more than a million missions in B-17 Flying Fortresses like the one I was about to board. I bet they were nervous, too. Sure, we wouldn't be bombing anything, nor would we face anti-aircraft artillery, malicious Messerschmitts, or zealous Zeroes. We probably wouldn't be blown out of the sky, or auger in, or join the caterpillar club, but I was still nervous, because "vintage" is not usually what travelers yearn for in selecting their means of conveyance. 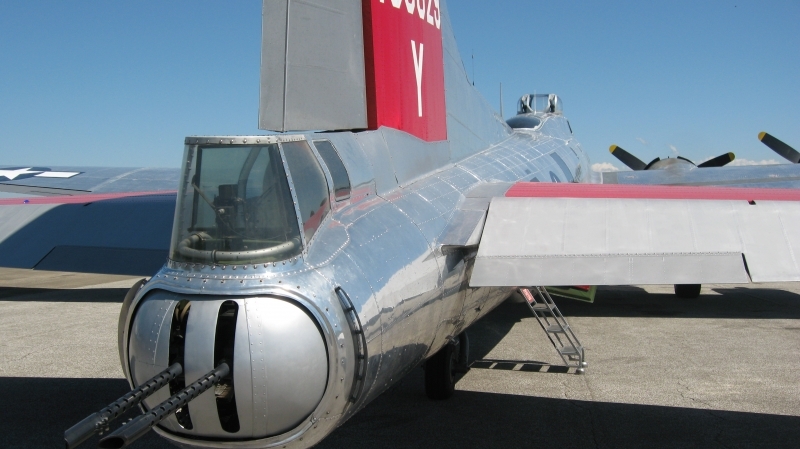 But this particular 68 year-old aircraft – owned by the Yankee Air Force, a museum organization based in Michigan – never did see combat; it was completed in mid-1945 and delivered to the United States Army Air Force as World War II finally drew to a close, and then leased to the Coast Guard. All of her weapons of war were stripped from her as her mission transitioned from that of mayhem to that of mercy. During the 1960s, the heavily-modified taildragger bounced around doing yeoman's work, fighting fires and dusting crops before being cast in the 1969 epic film "Tora, Tora, Tora." 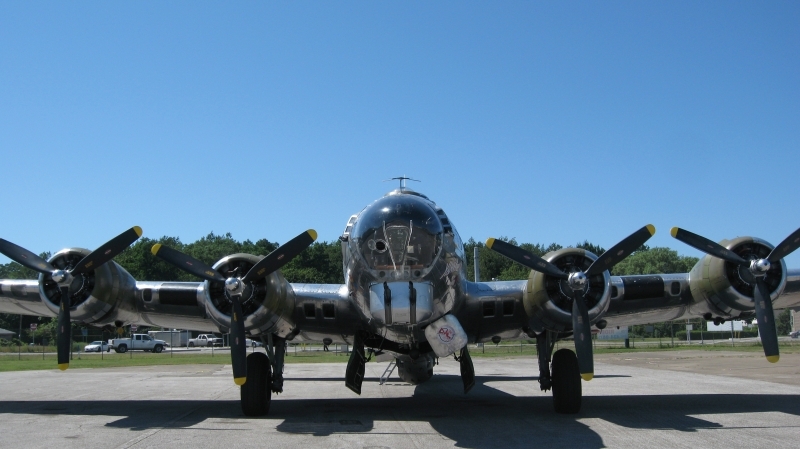 In 1986, it was purchased by the YAF for $250,000 and remained grounded for almost a decade as the museum began restoration that included removing a side cargo door and replacing every single inch of wiring. "It's completely restored to original condition," said Norm Ellickson, crew chief and flight engineer of the Yankee Lady. "It's probably 98 percent authentic, except today we have modern radios and GPS." Today, this aircraft – silver and sleek and clunky and classy and almost deco in its proportions and lines – was parked on the tarmac outside North Coast Air's hangar at the northwestern end of Erie International Airport/Tom Ridge Field, the honored guest at "Wings over Wheels: Celebrating Erie's Runway to the Future," an air show/car show/ribbon-cutting ceremony for the newly-completed Runway 6-24 extension project. I climbed aboard through the tiny hatch near the tail, and was immediately shocked at just how small it was inside; barely tall enough for 6-odd foot of man to stand up in – and nowhere near as wide – the fuselage was packed cheek-to-jowl with levers, cables, chairs, gauges, placards, radios the size of small cabinets, and, machine guns. Huge, belt-fed machine guns – up front, out back, up top, down below, and on each side. The entire aircraft is unpressurized and unheated; horrifyingly, in the center of the its body rests a small gangway, no more than six inches wide and resembling a steel I-beam. This small gangway is all that connects aft with fore, and when the bomb bay doors beneath it open, all that prevents the crew from being sucked out to a frigid, hypoxic, splattery death is a series of hardly-comforting rope handrails located about knee-height on each side of the gangway. It is from this loud, windy, surreal spot that America's arsenals of democracy dispensed their load, 4,800 pounds at a time, over France, Germany, and parts of the Pacific. I took my seat right up front – in the nose turret – and buckled in just as the engines began to crank: inboard starboard, outboard starboard, inboard port, outboard port. We taxied from the ramp with the awkward gait of a taildragger – aircraft with a tail wheel (as opposed to a nose wheel) are notoriously difficult to deal with on the ground, as testified to by the shrieking of the massive brakes on the main landing gear. Finally, we approached that final left turn that would place us on the active runway – coincidentally, Runway 6, Erie's runway to the future that was, in this case, my runway to the past. All of a sudden, the four Wright R-1820-97 nine-cylinder turbocharged radial engines growled and hummed and seemed to shake the very foundation of reality from its celestial moorings. These things were loud as hell and immediately provoked the "flight" response of both passengers and airframe itself – every fiber of my being screamed in agony as every nerve in my body prepared every muscle in my body to take any possible means of egress. It was difficult to suppress, but there wasn't much choice. As we – 11 passengers and three crew – proceeded on our takeoff roll, pointed East-North East, propelled towards rotational velocity by almost 5,000 horsepower, all 56,000 pounds of the Yankee Lady shuddered and groaned. We headed east, and from my cramped, tiny perch in the plexiglass globe attached to the nose of the aircraft, I watched downtown slip beneath my feet, flanked by the peninsula on my left. reflecting back from the warm, grey concrete, the wind noise picked up as we approached 200 miles per hour. We headed east, and from my cramped, tiny perch in the plexiglass globe attached to the nose of the aircraft, I watched downtown slip beneath my feet, flanked by the peninsula on my left. It's a beautiful downtown when you're only 3,000 feet above it; or, you could argue that it's a beautiful downtown once you're 3,000 feet above it, removed from the vacant storefronts, boarded-up houses, and panhandlers. But as we approached the verdant, rolling grape fields east of town, we made a sweeping left turn, out over the lake. Now, to my left, far off in the distance to the south, a few small hills became visible, inking out a dark green contrast to the severe clear of the blue skies above and framing this entire valley-like plain that is the Erie region. This perspective was both frightening and enlightening; focusing only on the downtown area often blinds us to the fact that we are part of a larger region, a larger world, just over those hills. We exist, as a community, in communion with all that – all of it, from here to Harrisburg to Hamburg to Hanoi. Our prosperity, no longer negotiated at the barrel of a gun, is linked. We again made a wide circle around the city, headed out over the bay, and prepared to make that series of left turns that would align us with that runway to the past/future. I could see our home field, a flat oasis amidst a sea of trees, buildings, and cars hustling and bustling on a sunny summer Saturday, and I was grateful for it. Almost 80,000 of the brave men who crewed B-17s during World War II never got to see their home field once they'd left it. But those who did, those who came back and built this country with their hands and made it great – they didn't have time to be nervous about strengthening their communities anymore. They took the perspective they gained thousands of feet above the graveyards they were made to create and built all those runways to futures past. As we floated just feet above that runway for what seemed like an eternity, the ferocity of the engines quelled, the wind noise dying down, all was peaceful, quiet, even Zen-like. Then the wheels hit reality with an audible squeal. Back, on Earth, in Erie, the aircraft came to a complete stop. I crawled out that same tiny hatch and put my boots on that runway to the future. At nearly 70 years old, the Yankee Lady was no precocious schoolgirl, but rather a teacher – a teacher of lessons learned from the past, and applied to the future. And in today's nervous business climate, let's hope Erie's leaders, too, can find their perspective before our runway to the future becomes our bridge to nowhere. 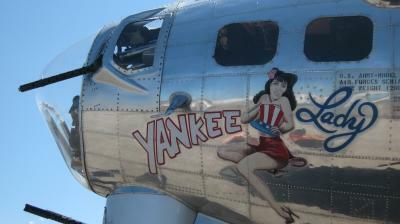 For more information on "Wings over Wheels," visit ErieAirShow.com. Sunday's hours are from 10 a.m. to 4 p.m.